The stiff breeze continued to sweep across the marsh but with a sunny disposition I was situated on the track beside the mitigation area on No.3 tank. Mitigation area of No.3 tank from the banks of No.5 tank. An overly active Avocet was on the scrapes with 10 Black-tailed Godwit nearby. A couple of Ringed Plover and Lapwing added to a very busy end of April. 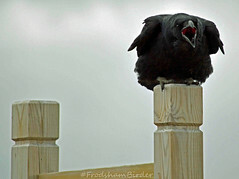 27 Raven dwarfed an attendant 17 Jackdaw feeding over the fence from the wet scrape. The male Marsh Harrier flew over en route to No.4 tank. Whitethroat, Reed Warbler, Sedge Warbler and Swallow were about the area. Observers: Ron Brumby (image 5), WSM (images 1-4). A male Marsh Harrier was seen several times around the area of No.6 tank and a Wheatear south of the tank. Observer and image: Tony Broome. A 32 strong group of walkers joined me on an amble along Moorditch Lane, through the track on No.5 tank to the mitigation area on No.1 tank. A small party of Golden Plover were settled into the wind on the edge of the flooded area of No.6 tank with half a dozen Dunlin. A group of 25 Ringed Plover flew in when the tide began to flood the river. Three Common Snipe and a flock of 40 Curlew flew over and out to the river. Shelduck numbers are gathering pace with 70 birds present on the open water. Common Teal have virtually departed the marsh except for a few pairs settled in the area. The Grey Heron was snuggled down low in its nest and barely revealed any of its body. A Peregrine perched on the blue-topped chimney chose to sit on the outer lip and proved difficult to show or convince everybody that there was a bird there. A dozen Raven sailed through from mutton munching on Frodsham Score and headed south over the hills. A roost of 50 immature and sub-adult Great Black-backed Gulls with smaller numbers of Lesser Black-backs were roosting at dusk on the tank. The group eventually reached the mitigation area and the stiff cold breeze kept most of the summer migrants low down in cover or simply remaining quiet. However, someone spotted the male Marsh Harrier quartering the reed beds on No.6 tank which saved the day. A Wheatear was along the pipes at Marsh Farm. The Avocets were not present on No.3 tank although we could hear one calling nearby. Birds lingering on the mitigation area included: 5 Dunlin, 6 Ringed Plover and a Little Ringed Plover. There were also a couple of pairs of Shoveler and Gadwall present. No.6 tank was a good spot for White Wagtail with about a dozen birds present, a Yellow Wagtail, 20 Meadow Pipit and 7 Wheatear were also noted. A small party of Ringed Plover, 1 Little Ringed Plover and 4 Dunlin dropped. After starting our Frodsham Festival of Walks first visit to Frodsham Marsh (a group of 28) on the motorway bridge at Brook Furlong Lane/Marsh Lane., we made our way along Moorditch Lane. Soon after we stopped off to pick up a singing Lesser Whitethroat probably the bird from yesterday. There were plenty of spring migrants about which were either passing through to the north or setting up their breeding patches. The area of No.6 tank was a bit more productive today with a similar array of ducks and the wetter muddy margins held a small flock of Golden Plover ‘northern form’, 6 Dunlin and a solitary Black-tailed Godwit. Moving further on we stopped to check the mitigation area on no.3 tank where 3 Avocet were still present, a flock of 16 Dunlin dropped in from the river and 6 Ringed Plover were busy chasing each other on the exposed muddy areas. A Whimbrel was heard whistling distantly but couldn’t be picked up. A plentiful supply of Common Buzzards were a good indication to their success over the last few decades and Frodsham Marsh is one of its strongholds. Following the track and circumnavigating No.6 tank we walked along Lordship Lane to the junction of Haresfinch, Moorditch and Lordship Lanes. The ploughed fields here attracted 4 Wheatear and a grassy field nearby held two more birds which allowed us to watch them closely. Butterflies: Orange Tip, Large White, Comma, Tortoiseshell and Peacock. Frodsham Festival of Walks Birders. In the evening Sean managed to see 16 Golden Plover, 30 Dunlin, 8 Ringed plover, 2 Whimbrel and 2 White Wagtail. 3 Common Sandpiper were on the Weaver Bend. The male Marsh Harrier put in another appearance. After my week away I was gagging to get down to the marsh to see what was about. I parked up by the ramp and was immediately greeted by a singing Lesser Whitethroat in the fully leafed hedgerow bordering the fields that leads out towards the motorway from Moorditch Lane…a good start. Soon after a reeling Grasshopper Warbler, Whitethroat and Blackcap had obviously arrived since my last visit. A Comma Butterfly sunning itself on some garden flytipping stayed long enough to be snapped. No.6 tank lacked a bit of gusto with 17 Tufted Duck, 6 Mute Swan, a few Common Teal and Common Shelduck being meager fare for the seasonal migration. I continued along the newly paved track above No.6 and headed off to the mitigation area on No.3 tank. There I met Sean who had been scoping the birds on the scrapes in the rain. Three Avocet looked likely to be establishing a territory here with 4 Ringed Plover, a Dunlin and a Black-tailed Godwit. Soon after Sean departed I was happily scoping the surrounding area but a squall of rain forced me to seek cover in a belt of trees (just a few remnants from the mass clear out of trees here recently). The rain came in, back up by the Icelandic wind the weather man had promised earlier on the forecast. Just after the rain was beginning to ease, all of the duck and waders rose from the water and there overhead was an Osprey! I presume the raptor had dropped height when passing over from the hills in the squall. With all my camera gear securely tucked away from the weather I gave up attempting to get a picture and just watched it fly over to the Canal Pools before heading out towards Hale Head. Soon after the Osprey flew through the rain cleared and out popped the male Marsh Harrier hunting the reed beds of No.6 tank. The usual Peregrine was perched on the big blue chimney at Weston Point. The rain brought in a Swift, 40 Meadow Pipit, Swallow and Sand Martins. After Sean had departed he made his way down to the Weaver Bend were there were plenty of Swallow and a few House Martin. On the river was a small flock of 26 Black-tailed Godwit, 7 Redshank, a Ruff (in stunning summer plumage), 2 Common Sandpiper, 4 Swift high over heading north and 4 Wheatear along the pipes on No.1 tank. This afternoon on the marsh and there were 2 Avocet and a Whimbrel on the mitigation area. While No.6 tank had 2 Little Ringed Plover, 18 Golden Plover, 3 Yellow Wagtail and 4 White Wagtail. There was also 4 Wheatear on No.1 tank and 2 more Little Ringed Plover were present over on the Weaver Bend. Out this morning along the Manchester Ship Canal around No.4 and 6 tanks. Blackcaps were the most vocal along the canal path with smaller numbers of Chiffchaff heard and seen. 3 Wheatear were sat on driftwood on the waterside while good numbers of Sand Martin hawked overhead. Out on Frodsham Score salt marsh and 2 Egyptian Geese were sat amongst the Canadian and Greylags and then flew west along the river. Reed and Sedge Warbler were singing in the reeds at the edge of No.4 and a Fox crossed my path only to disappear over the bank. 2 Avocet were on the mitigation pool as were good numbers of Shoveler, Mallard, Teal, Gadwall and 2 Shelduck. The Grey Heron sat tight on its nest on No.6 and was joined by its mate as a Cormorant sat close by. A party of 11 Mute Swan were on the water and a Common Sandpiper flew along the bank. On to Lordship Lane and Common Whitethroat were more vocal of the birds present and 2 male Whinchat were fly-catching from the hawthorn bushes near the model flying field. A pair of Kestrel were copulating close to the owl box near the blue storage tank and Common Buzzard were displaying over head. A Cuckoo seen near the secluded pool at the corner of No.6 tank (where the road bends round to the mitigation pools).